The makers of Steelwater Gun Safes are security industry experts. That’s why they are committed to fixing the security and durability problems that other safe makers overlook. For example, gun safes with flimsy particle board shelves don’t hold up well over time– that’s why all safes made by Steelwater Gun feature steel shelves. Also, all Steelwater Gun safes have extra thick steel foundations. The extra steel prevents robbers from rocking your safe back and forth until the bolts on the bottom rip through the metal. Additionally, Steelwater Gun safes all have reinforced metal protecting all the internal gears and mechanisms surrounding the lock. Another great thing about this safe manufacturer is that it offers free delivery, a lifetime warranty and military / law enforcement discounts. Most other safe manufacturers don’t give discounts and they usually offer only time limited warranty plans. This 16 gun medium sized safe from Steelwater is exceptionally hard to break into because it has built-in protections against all the major safe attacks. It’s also quite stylish compared to most safes on the market. 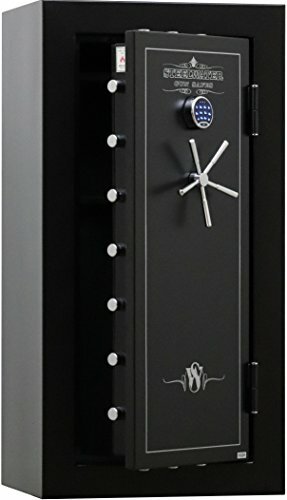 Give it a hard look if you’re in the market for a small to medium sized safe that has a ton of security features. Pry proof. This safe has a 12 gauge solid steel door that’s designed to prevent thieves from prying it open. Drill proof. Steelwater’s patented gear drive locking system blocks intruders from using drills and other tools to open the safe. Extra steel reinforcement. The AMSW592216 has eight times more hardplate surface compared to the competition, making it extra resistant against break-ins. Fire resistant. Even in the middle of a 1550 degree blaze, this safe is designed to keep the contents inside cool for up to 45 minutes. Tamper proof. Even if an intruder manages to remove the lock, the spring-loaded bolt will keep the door from opening. Attractive design. No need to hide this safe away in a basement– it’ll enhance the look of any room in the house. Free dehumidifier. Like all Steelwater safes, this one comes with a free rechargeable silica gel dehumidifier system. This safe doesn’t have as much fire resistance compared to some other safes on the market. Measuring 59″ tall, 28″ wide and 18″ deep, Steelwater’s medium-sized safe is big enough to hold about 20 guns. However, it’s still small enough to fit into a crowded storage space. If you like the Steelwater brand but don’t have the money or space to accommodate Steelwater’s massive 22 gun safe, this may be the safe for you. Holds up against crowbars. The 12 gauge solid steel doors are thick enough to resist any type of prying attack. Drill won’t work, either. Steelwater has come up with a clever gear drive locking system that kicks into effect when thieves attempt to penetrate the safe with drill. More hardplate. The extra “hardplate” surface area inside the door prevents intruders from tampering the with mechanisms surrounding the lock. Fire protection. 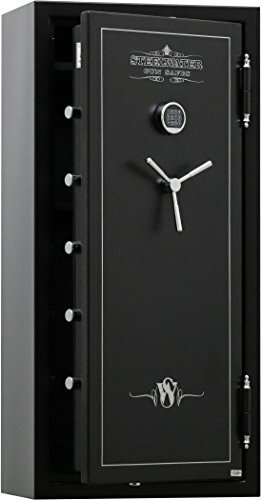 This safe is designed to withstand a 1550 degree inferno for up to 45 minutes. Spring loaded bolts. This last ditch safeguard kicks in if the robbers manage to pull the lock out of the safe’s door. Stylish looks. Some safes look like ugly hunks of metal, but this one will blend in well anywhere you station it. Rechargeable dehumidifier. Like all Steelwater products, this safe comes with a free silica gel dehumidifier system. Steelwater safes have tons of extra security features, but don’t hold up as well in fires compared to other safes. Measuring 59″ tall, 30″ wide and 24″ deep, Steelwater’s huge 22 gun safe is the biggest safe in the company’s catalogue. If you have a large, expensive gun collection that you need to protect, this could be the safe you’re looking for. It has several unique security features not found on other safes. Impossible to pry open. This safe’s ultra thick, 12 gauge solid steel doors will hold up against any crowbar based attempt to open up the doors. Unique gear drive auto-lock. Steelwater’s patented gear drive system guards against the use of drills and other tools crooks often use to penetrate safe walls. Extra steel around the lock. The extra big plate inside the door stops burglars from destroying the gears that surround the main lock. Resists 1550 degree heat. With this safe, you get complete protection against the hottest types of fires for up to 45 minutes. Spring bolt mechanism. This feature saves the day if the robbers somehow manage to extract the main lock. Attractive exterior. This safe’s retro metal fixtures give it a pleasing, old-fashioned look. Comes with a dehumidifier. You get a free silica gel dehumidifier system when you buy this safe. Steelwater safes offer a respectable amount of protection against fires, but safes built by other companies last longer in a blaze.